We’re beginning the fourth week of our Worthington Twitter Challenge. Over the past three weeks those who have been participating with us have been answering a question each day and posting it on their Twitter account. Each post is categorized by the hashtag #ItsWorthIt so that you can search responses anytime. Our goal for the Twitter challenge is simply to connect our educators and our community. It’s to learn from each other and hopefully to build the habit of open communication using the Twitter platform. On Day #8 of the challenge each participant was asked to share a professional read that they found valuable. There were many interesting books shared including some such as Mindset by Carol Dweck and The Energy Bus by Jon Gordon that I really value. 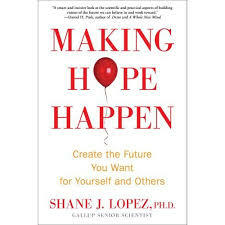 But, for my book I chose Making Hope Happen by Shane Lopez. In Making Hope Happen Lopez writes about proven strategies and techniques for building a high-hope mindset and for meeting short- and long-term challenges. He brings the research alive through the stories of real people students, parents, teachers, small businesspeople, and civic leaders who made the most of their own hopes and generated ripples of hope that transformed their schools, businesses, and communities. The book is organized into four parts, with the first two (“Thinking About the Future” and “Choosing a Better Tomorrow”) describing the science of hopeful thought and its implications. Parts three and four (“Practicing the Three Hope Strategies” and “Creating a Network of Hope”) provide strategies for creating a better tomorrow by enhancing levels of hope in our own lives and by making our hope go viral. By the end of the book, you’ve learned the fundamental truths of hope: that hope matters, hope is a choice, hope can be learned, and hope can be spread to others. Making Hope Happen is important for our students. Battelle for Kids explains it best when they explain that students must be prepared to navigate the many challenges of life, which can be unpredictable, even with the best of plans! Hope is the state of mind that helps students navigate life’s twists and turns, and keeps them moving forward, even when obstacles arise. Hopeful students believe their future will be better than their present and they have the power to make it so. Hopeful students understand there are multiple pathways to success and anticipate obstacles and plan for them. When students have hope for the future, they take their education more seriously and bring positive ideas and lots of energy into the learning process, which in turn makes emotional engagement in learning more likely. If you have not created a Twitter account, consider doing it today and joining the final week of our challenge. It’s free and can be easily created and conducted on your smartphone or computer. Steps to Set Up a Twitter Account If you’re in the market for a good book, check out Making Hope Happen by Shane Lopez. Assessment has become a major industry and a driver of policy in public education. The setting of cut scores is not an exact science and it’s important that parents and community members know how a cut score was set in order to understand what the assessment results are actually telling us. For some background on setting cut scores, Catherine Gewertz wrote in Education Week that: The two common-assessment consortia (PARCC and AIR) are taking early steps to align the “college readiness” achievement levels on their tests with the rigorous proficiency standard of the National Assessment of Educational Progress, a move that is expected to set many states up for a steep drop in scores. In Ohio, the State Board of Education set cut scores that generally show 60 to 70 percent of students are “proficient” or better, according to preliminary results of new assessments given last spring based on Common Core Standards. However, only 26 to 46 percent of Ohio students hit the college ready measure under benchmarks set by the PARCC. The paper goes on to talk about setting cut scores, and some of it is pretty technical, but it returns repeatedly to the notion that at various critical junctures, some human being is going to make a judgment call. So, did Ohio set the cut scores too low? Time will tell and I’ll leave that for the experts to determine. When we see our (PARCC) scores it’s important that whether the scores are good or not as good as we would like, we’ll need to remember that the Ohio legislature determined we should not give these tests again. Thus, we’ll have scores for last year and last year only on these tests. Secondly, and most importantly, our goal is to make certain that every student in Worthington is life ready when they leave our school district. This means that they are ready for college or their chosen career and that they possess the necessary soft skills of grit and perseverance. Assessments help us gauge this, but they will never tell the whole story. If you read the newspapers it’s easy to believe that our students aren’t learning what they need to. I believe it’s just the opposite. Our students are learning more than students of any previous generation! If you’re able to come sit in one of our classrooms, any one of our classrooms, and see what our students are doing you will be impressed! Last year I served as the evaluator of the 8th grade teachers at Phoenix Middle School. One of my jobs was to evaluate 8th grade math teacher Kevin Hall. I hold a doctorate in education and have taken advanced statistics classes and applied those advanced statistics in research. But, sitting in Kevin Hall’s Math 8 class was eye opening. They might as well have been speaking another language. The material and the learning going on was so far above my understanding I was blown away. Parents throughout our school district will tell you a similar story. Our students are learning at high levels. The reality is, our students today have to learn at these high levels. The world has changed and our students must now be ready to compete on a global scale. Doing what we’ve always done is not good enough. Over the next month or two we’ll begin to see the assessment results from last year’s new assessments. We’ll analyze the data and look for systematic areas for us to improve. We’ll use the data to help make personalized plans to help students grow. And, we’ll work to keep all of it in the right perspective. The assessment results tell us a story, just not the whole story. When I was a kid I would lace up my Zips tennis shoes and run as fast as I could. Unfortunately I could never run as fast as Chris Szabo. Chris was just plain fast and she could run all day. As I’ve gotten older I have accepted the fact that while I run most days for fitness, there will always be someone faster than I am. At last week’s Worthington Warrior Wellness run 1,500 of our students and staff came out to conquer the one-mile course. As sometimes happens in Ohio our beautiful 70-degree weather changed drastically and Friday night set in at 48 degrees, rain and wind. It was bone-chilling cold and yet….people still came. They came to challenge themselves as they would run the course, crawl through mud, and jump over obstacles. They came to buy hot chocolate from the Kona Ice truck and they came to listen to Bailey Andrews sing a stirring rendition of the Star Spangled Banner. I’m proud of all of our students who challenged themselves and attempted the course, but I’m particularly proud of Worthington Estates students Alex Cole and Charlie Holtsberry! Alex and Charlie are not natural runners. As humans most of us enjoy those things that come easily to us. I’ve always assumed Chris Szabo loved to run. She was so good at it. But for Alex and Charlie the one mile course would be a significant challenge. They would have to push themselves to finish the course and they would be forced to do this publicly in front of the 3,000 or so spectators that I estimate were at this event. Most of us wouldn’t have the courage to do this. Instead, we’d have chosen to stay home and play it safe. Alex and Charlie chose to go for it and by their side was Worthington Estates Physical Education Teacher Bryan Troast. 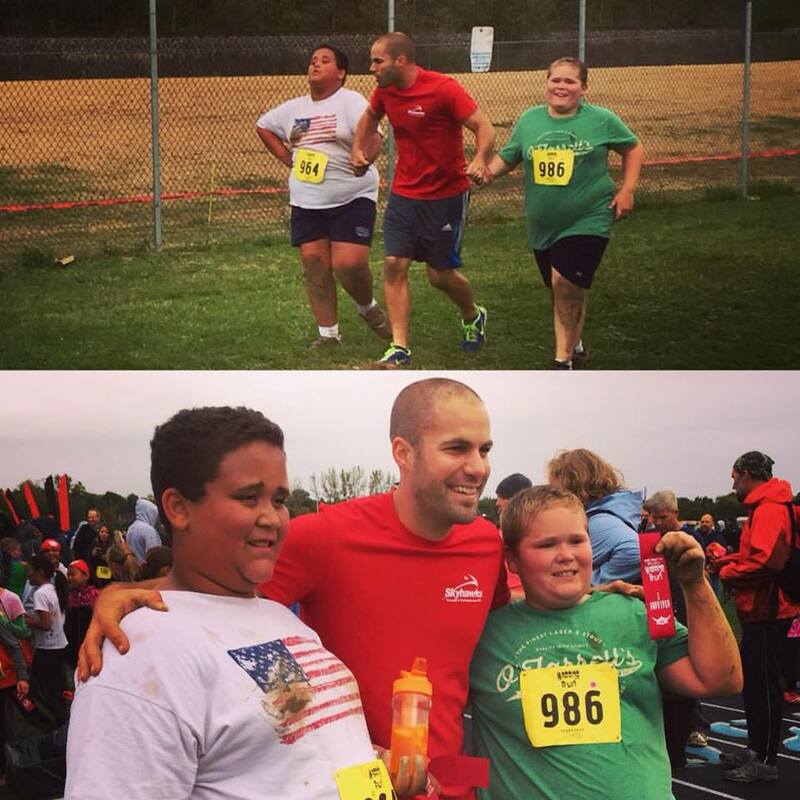 Bryan takes physical fitness very seriously and he runs a Worthington Estates Fit Club for his elementary students. It’s part crossfit, part elementary gym class, and Alex and Charlie have been active participants. While Alex and Charlie would have to work extra hard to complete the Warrior Run, their teacher Mr. Troast would be with them every single step of the way. He encouraged them, he pushed them, and he picked them up from the mud. From my perspective, that’s what it’s all about. We want every student in Worthington to push themselves farther than they once believed was possible and we want a trusted adult to partner with them every step of the way. It will still be difficult for the student, just like it was difficult for Alex and Charlie, the student will still have to do the hard work, just like Alex and Charlie, but each student should have someone partnering with them like Mr. Troast. Last week Alex and Charlie conquered the Warrior Run. There were some really fast kids in this run, but I was most proud of our students who ran at the back of the pack. Those who really challenged themselves and those who accomplished their goal. In Worthington, the safety of our school community is our number one priority. Unfortunately the effects of drugs and alcohol impact youth across our country. As a school district we continue to work with various community groups to identify solutions and protect our students from using illegal substances and from participating in other activities that have a negative impact on their development. In an effort to make certain our students are able to attend schools that are free from drugs and alcohol, this morning, we worked in partnership with the Worthington Police Department, the Hilliard Police Department, the Columbus Police Department, the Licking County Sheriff’s Office, the Fairfield County Sheriff’s Office, the Grove City Police Department, the Richwood Police Department, and the Westerville Police Department to search designated areas in our high schools. Our schools were placed into a lockdown at 8:45 A.M., meaning all students and staff will were asked to remain in their respective classrooms. We made sure to emphasize over the public address system that there was no threat in the school and no reason for students to be concerned. 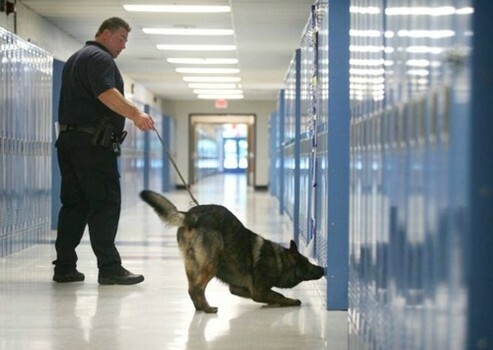 Around 9:00 A.M. the police brought the canine units into the school and throughout the parking lot, where the dogs searched designated areas. Classes were able to continue but students were asked to stay out of the hallways. In electing to partner with local law enforcement to bring canines on campus our goal was not to catch any of our students, but instead, our goal was to deter negative behavior and to provide students with a strong reason why they should say “no” to negative peer pressure. With this in mind all students were provided an opportunity to “self-refer” to their teacher if they knew they were in possession of an illegal substance. Those students who elected to self-refer were dealt with only through school discipline and were not charged criminally. All students who self-referred or were caught with an illegal substance will be provided with drug and alcohol education courses and their families will be provided with the necessary resources to help their child moving forward. We know that the issue of student drug and alcohol use is reflective of activity throughout our community, however; we believe we must emphasize that illegal substances are not permitted on school grounds. In addition to our strong “Do not use on campus” message, we also do not condone the use of drugs and alcohol anywhere for our students. We encourage them to lead healthy lives and make decisions that support success in life, today and long after they graduate from the Worthington Schools. As we move forward our plan is to utilize canines periodically in all of our secondary (7-12) schools. Our hope is that our community will continue to partner with us to help set the expectation that our students are drug and alcohol free. I once read that taking an image, freezing a moment, reveals how rich reality truly is. I think the picture above sums this up perfectly. If you haven’t looked closely at the picture you may not realize that the young lady in the pink is not as young as she used to be, and is actually our music teacher at Evening Street Elementary, Kristen Jarzecki. As part of her morning duties, Kristen supervises the cross-walk along Evening Street that separates the street from the school parking lot. Throughout the winter months, Mrs. Jarzecki is at her post each morning wearing big warm boots and a furry hood on her coat. If you drive by during those winter months you may mistake her for an Eskimo. During these first few weeks of school Mrs. Jarzecki as able to dress more comfortably and on this day she chose pink. What the picture freezes is really a special moment and one that captures how rich the reality of student and teacher relationship is throughout Worthington Schools. The students frozen in this picture are not actually Evening Street students. 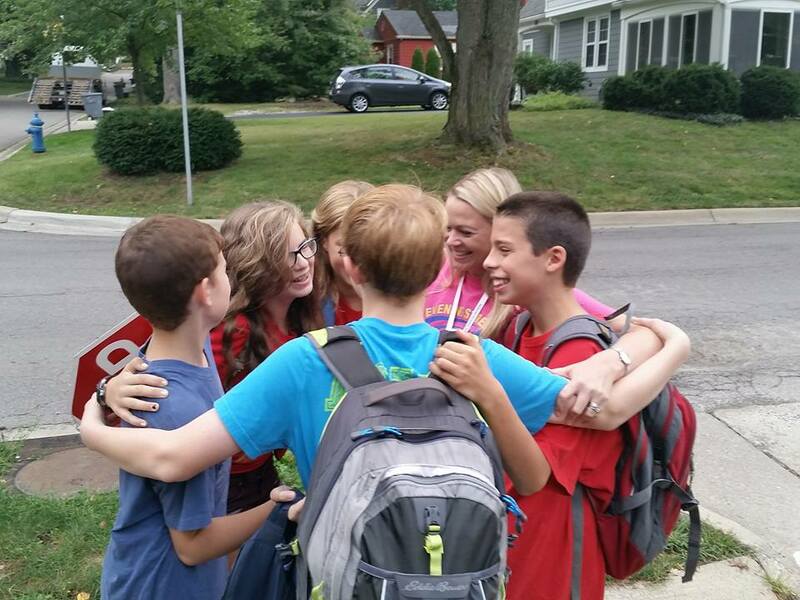 Instead, they are Kilbourne Middle School students who are walking towards their school. They’ve chosen on their own to deviate from their path (middle school students have been known to deviate from their path) in order to come back and talk with their former elementary music teacher. Imagine that, they’re middle school students who chose to seek out an adult and they are actually willing to talk with this adult who they have forged a positive relationship with, and who they know will be happy to see them (while middle school students often deviate from their path, they don’t often choose to seek out their teacher when they do this…). 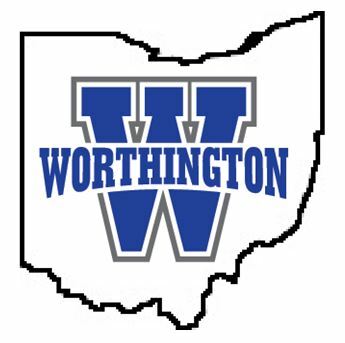 In Worthington we’re striving to make certain that every child in our school system has a trusted adult or many trusted adults who they know believe in them and will help them be successful. This quick moment, frozen in time, shows me that for some of our students Mrs. Jarzecki is that trusted adult. The rich reality is that I believe we have a school district full of teachers doing similar work.